Thousands of low income families and individuals benefit from free food baskets prepared especially for the Holidays by Sun Youth’s volunteers. 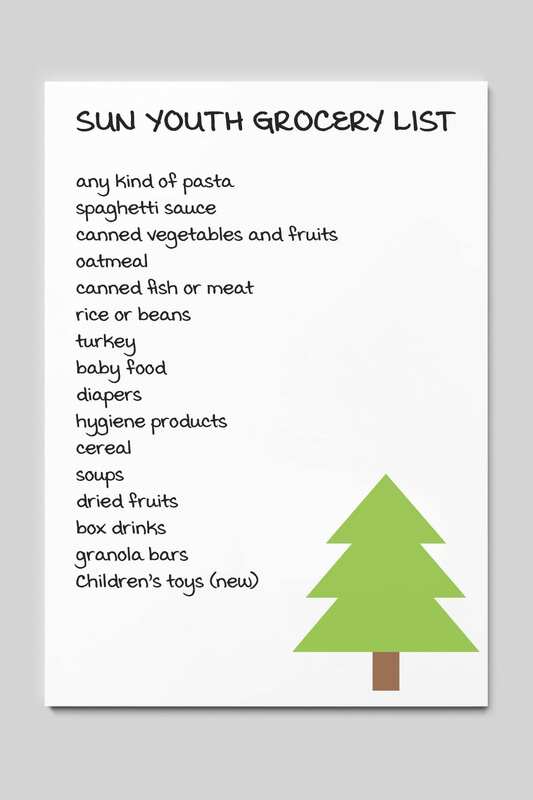 The Christmas baskets giveaway is held each year between December 18th and 24th. Chanukah baskets are distributed during the same period depending upon the Hebrew calendar. Registrations for Christmas and Chanukah hampers begin in late August. Some data is sent to a central database, the Christmas Index, to verify if people registered with Sun Youth are also receiving from another organization. People wishing to register for a Christmas Basket need to come to Sun Youth with a proof of address, a proof of income and identification cards of all family members. Registrations are done Monday through Friday, from 9 am to 4 pm. Sun Youth distributes food hampers to approximately 12,000 people each year. Children aged 12 years old and under are given a new toy or a new game. Sun Youth could not accomplish this major distribution without the participation of all the volunteers and donors involved in our Holiday season campaign every year as well as the indispensable Big Media Food Drive.